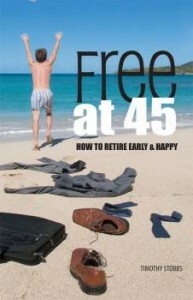 Timothy Stobbs, the author of the book Free at 45 – How to Retire Early and Happy (link), may be better known to you as the blogger behind Canadian Dream – Free at 45. Tim recently completed his book project and contacted me to help spread the word with a review. I must admit that I’m always impressed by bloggers who have time for a full time job, a full time blog, kids AND a book. Personally, I have no idea how I would find time to write a book with my current obligations, so before I start the review I’d like to extend a congratulations to Tim! As I’ve been following Tim’s journey since he started his blog (around the same time as MDJ) I must admit that I was eager to dig into his latest creation. The book, as the title suggests, gives advice on the steps required to achieve early retirement, but more importantly, how to do so happily. You might expect that a personal finance blogger would write a book on early retirement completely based on numbers, how much to save etc, but this book includes refreshing perspective of the psychological aspects of retirement. Tim Stobbs is a personal finance writer who has written for the Toronto Star and the popular blog “Canadian Dream: Free at 45”. Tim’s straightforward approach to happiness and finances has resulted in interviews with The National Post, The Globe & Mail and CBC Radio’s “The Current”. He lives in Regina, SK. Why do you want to retire? Where’s the Money Going Now? Contest will end Sat 5pm EST April 23, 2011 and the winner, drawn randomly, will be contacted shortly after! Just under 40. $250k in savings/retirement. No liabilities. Either retiring early or creating new employment with less stress/responsibility. Like to have the choice at 50 to continue or not. Maximizing TFSA and wish can do more later. $2M in investable assets + paid off rental + paid of primary residence. I think I’m starting to think that going back to school and getting a PhD would be fun. Being a student again, but having enough money to not live like one. 36, just over $400K in assets. Mtg should be retired in 6 years. Looking to retire from the rat race and work for myself. The latter being an option if I can successfully transition to this sooner. 34, ~300k net assets. Mtg < 50k left and hoping to retire early and going back to school and take lessons. Music lessons, woodworking, leisure sports..doing things that extends your life and make it happier too..
Late to the game. Hope to retire at 57. Mortgage paid off later this year – yahoo! Follow Tim’s blog too and would love to win his book. I am 23 years old at the moment and hope to retire by 55 at the latest but hopefully much sooner. Still a student (graduating next year to be an Engi) so its a long ways away but currently have 10k+ invested in a TFSA using a modified couch potato strategy. I would need to have 2 million in today’s dollar before I figure I am able to retire. Clearly a retirement book that aims to layout the plans to retire at 45 is much more suited for a young person like myself :D.
Hope to retire around 50, with enough assets to match today’s expenses, after inflation, at the 4% withdrawal rule. currently 27, goal is to go into a semi retirement at 50, at which point i would like to open up a small cafe. Returing permenatetly at 50 doesn`t have a strong appeal to me as i dont know what i would do the rest of my life! I`d require about 2.3 million in today`s money to accomplish my goals comfortably. I am 28. My goal is to retire no later than 50, earlier is better. So far I have a net worth of 200K with 50K in my RRSP/TFSA. Congrats to Tim, like you said it’s a great achievement to be able to manage a career, a blog, and write a book while raising a family. I haven’t really figured out a retirement age yet, but I would say 55 is the latest that I would like to get out of the rat race. Not sure what kind of portfolio size I would need but I have been loading up on dividend growth stocks and hope to live off the dividends in retirement. Hope to retire at 55 and do some travelling. I plan to retire at 60 around 70k annual salary. I’m 26, with only about 15K net worth. As my wife is currently on mat. leave we’re working to save as much as possible until she’s back to work. Once she’s back to work we’re going to start saving as much as humanly possible in order to invest in our future. We don’t have a set retirement age yet, but we know were want to be comfortable enough to slow down by the time our first child turns 20 (age 46ish). started to index early at 28 and am now just looking to gain as much knowledge as possible. Just turned 34 yrs old. Net worth is about 450k. I plan to retire at age 56. (Hopefully – when my Defined Benefit Pension Plan kicks in, and kids have finished post secondary education). The plan would also be to sell my rental properties at that time as well, and travel a lot, and spend time at my cottage. Just about 35 and “starting over” retirement planning in a way (changes in life sometimes mean changes in plans). The intention is to balance debt elimination and investing while raising a young family in our first home. Starting a business is always on the horizon, but a solid career/job keeps things stable for now. The detailed plan is perpetually in the works… and the first step is to become more financially literate. Hence, I started following MDJ and other great resources. Tim’s book looks excellent and will likely end up in my hands – free or not (fingers crossed for free!). Lots of debt getting my wife’s well paying job up and running. Little equity in principal residence and vacation property. Im 28, accumulated little bit over 400k asset from last 9 years, I started working since 19. my investment paying me around 2k per month right now. (dividends, interest, business income). I would like to quit my full time job this year. I’m 33, my husband is 35. Our net worth is nearly 700k, with under 30k left on the mortgage. My RRSP is maxed out, as are our TFSAs. We both have pensions (mine is a defined benefit). We’d like to retire before 60. I am 55 and starting a new business, which has been my dream. I don’t see retirement in my horizon any time soon. I would love to win this book. Just turn 34 and It s the first time I set a number for my retirement 7 millions at 60 already 1.2 millions in asset. So I could do it. Love Tom’s blog, its a must read for those wanting to retire early. I am currently 29 and plan to retire by 45 living comfortable and debt free. I am 32 and just starting a family. Our plan is to aim for early 50’s with a 100g / yr income supporting our travel habits. Currently, I am actively accumulating passive income sources (rentals, dividend payers, side contracts) as well as a small portion of the portfolio dedicated to high risk / high return stocks. Our goal is to skimp and save where we can, but be very careful not to short change ourselves on family fun at anytime throughout our lives. Max out the TFSA and find good dividend paying stocks. Looking to retire within the next 12 months – a milestone which has greatly accelerated in the past 2 years. Will still have a few years before I hit 50 and, hopefully, continued good health to enjoy it. Almost $2M NW, with only our Smith Manoeuvre HELOC as debt. Currently refining an investment strategy which should provide $250k+ in annual income. I’m excited about the prospect of filling each day with activities that I want to do, rather than need to do. 25 with nothing really saved for a nest egg yet. Just trying to pay off debt for now. Don’t think I’ll ever really retire, but what I’d like is the freedom to pursue whatever endeavor that interests me without worrying about long-term financial consequences. $1Million 15 years from now ought to do it, currently have $300k in assets. DRIPPING, maximizing RRSPs, paying off debt quickly. Now almost 42, and planning for retirement at 57, but some health issues might cause a reevaluation. In the last 2 years, converted everything from expensive mutual funds to ETFs and now concentrating on maximizing savings. I would love to retire around 50 – not set number – depends on health, family and so many other factors. The only strange part I saw from the book is that the author is not retired yet. That is like me publishing a “Millionaire Journey” book with me only having $100 in my chequing account. It seems premature. I hope to retire between 65 and 70 – even though I am well on my way to retirement savings, I would prefer to estimate very conservatively, and if I can retire earlier, it will be a happy surprise! would like to retire somewhere in the 50-55 range. that’s 20 years away. plan on traveling a lot after 55, so retirement income will probably be high. maybe 70-80K in today’s dollars, dropping off as we get less adventurous and mobile. I am not looking for retiring early as much as living confortabbly. I am 34 making 65K a year (recent job) and have lots of debts on shoulder amounts to 65 K that includes ( Car Loan, Credit Cards, and Student Loan). I cashed out my RRSP’s because I didnt have a steady source of income for a year. Currently 26 years old. I would like reach financial freedom for required expenses (food, transportation, housing expenses) somewhere between age 35-40, with no mortgage. This depends greatly on my execution of alternative income streams. After reaching financial freedom, I plan to take some time off and pursue personal endeavours which would produce a modest income for play money. I plan on gobbling up dividend paying large caps during economic downturns, as well as purchasing rental properties. I would like to semi-retire at 55. Maybe do some bookkeeping from home to keep my hand in it and keep my mind acitve. Hoping that $300,000 by then, with no debt, dividends/interest and the sideline income will be enough. Got started late, but would love to read the book. 39 with wife and 2 kids and debt-free for 4 years. On track for freedom 45 but left lucrative (but boring) contract to focus on building own corporation. Haven’t made millions yet but the dream is still alive – however dipping into savings to supplement low “start-up” revenues. I’ve recently been reading Early Retirement Extreme and Your Money or Your Life. Both great books that have me wanting to start saving a high % of income and putting it towards dividend paying stocks and start working towards the point where investment income = monthly expenses. It will be a long road but at 26 I think I can retire far earlier than a ‘normal’ retirement strategy. Age 35 with wife and 3 kids. Debt-free, with RRSPs and TFSAs maxed out. Also have 10 years served towards a defined benefit pension. Plan on retiring at age 55. 31 year old professional female. $200k in savings/retirement. No debt, no mortgage. Currently working a well paying job I hate. I want to be financially secure enough that I can follow other (most likely less well paying) employment dreams. Currently 30 and plan to be semi-retired by 50, fully by 55. Currently have a net worth of about 100K. 34 yrs, 150k in assets. Hope to retire at 60. I am 25, $2,300 in a TFSA. Want to move to partial retirement around 45 and run my own pizza shop. Currently 100% stocks. 37, married with 2 younguns. Net worth of about $600K, and hope to retire at 55 with about $2 mil. Wow the asset numbers in this thread are staggering – even for the younger folks! I’m turning 30 in a month and have no set date for retirement. I think this would be a good book to get me thinking about it more and then maybe I would set a date. Late thirties. Current plan is to maximize return by 100% in stocks. Planning to change my lifestyle by 50 to allow for greater freedom …. but not interested in traditional ‘retirement’ for a long time. In my 30’s and would like to go part-time by 45. Currently on track with 10% of my pay going to savings. It helps that my pension at work matches the 4% I contribute. Late 20s. No debt. If my retirement savings allow, hoping to retire from my profession by 50 to work in the non profit sector, or to at least have the choice to do so. Goal is to save (together with wife) about $100k every year for the next 20 years. Husband and I; both 40/debt and mortgage free/business owners with $1.8mil in net worth. 2 kids (23 and 17)…1 already out of the house and the second off to school next year. I am 37 and hope to retire at 55….maximizing our TFSA’s and paying down our mortgage and be debt free to travel etc. Working our way to 1 million of net worth, about half way there. Thanks. written about deferring pension income until age 71 . I want to retire at age 40 with a nest egg of 1 million in stocks that pay income, no debt. I know this is a tough goal, but it has been a dream of mine. I think once we start a family, we will not be able to reach this goal, unless one of us gets an increase in salary. Aged 57. Semi retired and will continue to part time work until it gets boring. I have all of $4000 in an RRSP and it keeps me up at night. I need the book! I plan to retire at 55 with $2M nestegg! 51 years old. Only five years into a high-paying job (with decent pension) after a mid-life return to school and career change. My retirement plan is that I’m so used to living on almost nothing that once I’ve paid off my current debts (mortgage, student loan) I’ll have much more than I need. And my pension is indexed. Retired at 58. 400k assets, own condo, 6600 company pension with good medical benefits, will take early CPP. Being single have many options. Sounds like a great book. My plan is to retire no later than 60. I plan on starting the savings process next year, when I have additional income to actually save. I am 51, and plan to retire at 65. 350K NW. I started saving late but catching up slowly. I can use some smart ideas with my plan and hopefully that book is what I hope it is. Married, 36 years old, 2 kids. $630K net worth. Will be mortgage free this year. The plan for both of us is to maximize TFSA’s RRSP’s, RESP’s and retire at 50, maybe earlier if the right part-time opportunity comes along. I am 65…hey I thought I would be retired by now!!! still sluging away. The way I figure is that for every year I work…one less year to spend. Have about $600K plus equity in house. Even though I like my job I would rather be spending more time on my boat, travelling and cycling. I’m 43 and plan to retire by 50, maybe work part-time past that. Have two rental properties with total mortgage of $7K left, will be paid off this year. RRSP and TSFA are maxed out. I’m 36. I’m a public servant so if I just chug along for the next 20-some-odd years to get to 30 years of service, I should be golden and have a nice retirement just before age 60. But I’m looking into alternative possibilities that would have me retiring as early as possible so that any paid work I do is based on choice and preferences rather than need. I’ve gotten rid of consumer debt and am now just starting saving and investing. I’m 27, and had started my retirement plan by investing 10k in mutual funds. I then realized that I took a great interest in investment properties, and stopped investing in my RRSPs. I’ve decided that investment properties are going to be my new RSP, currently I have two, both purchased with 20% down. I am using the extra income to pay down interest, that can later be used to leverage a third property. If I keep doing this for the next 15-20 years, I should have enough revenue generating properties to be financially independent. Hi, I am 20, and studying in university. I chose the coop option to come out of university with little to no debt. Yes I do graduate a year later, but will have 2 years of relevant experience with me. Currently I am making the most of governmental loans (tax free) by investing them in capital-guaranteed options. My goal is by the age of 50 to have a net worth equivalent to 1000oz of gold. Over 50, retiring in 6 years, pension, and RRSP of $250,000. House paid off next year. Four kids who have finished multiple University degrees (paid) and 2 weddings contribution to expense, 2 more weddings to go. Spouse with a good pension retiring in 2 years. 28 with approx. 30k in RRSP & TFSA. Working hard to hopefully retire by 55. Trying hard to max out RRSP & TFSA but recently learned working hard might not guarantee an early retirement. Now the focus is on how to manage my finance so I can have the money working for me. Looking at the free at 45 thing myself. Want to do it through real estate. I think between 10 and 15 doors cashflowing $700 each would do it. Currently 32 with 2 income properties… I’ll have to start learning how to get JV Partners soon I think. Currently have 3k$ in rrsp – I am still 21 yrs old and a student so I am trying to maximize my tfsa which will be used for downpayment towards my house. I do put around 1k/; year towards my rrsp. I’m 45, 230K in RRSPs, 1.5 rental properties. I’d like to retire at 60, but I really don’t have a plan. I guess a trip to a financial planner is in order. Thanks for all the details mentioned and it’s also interesting to see so many people expressing their plans about retirement. Very informative! Just want to be at peace with myself with sufficient funds to provide harmony and serenity for the balance of my life. I’m over 65 and cannot afford to retire as I still have a mortgage of almost 200K. I am looking forward to partial retirement very much and would like to begin doing a Ph.D. that I put off 30 years ago. Otherwise, I hope to have enough money to live without much anxiety with those I love. Plan is to be gone from work Oct 2012, that is next year after my 55th birthday! Fear – of not enough $ with too much time…..Always like to read other’s take on retirement. Education is wealth. Age 40 with wife and two young kids. Debt free and no mortgage. Net worth of about $600K including the house. Would love to read about Tim’s journey as his goal of freedom 45 is very similar to mine. 29 – Still paying off debt, I have a too-big mortgage and a too-small RRSP. I really need that book! -Job: Hate it, but the money is great! Currently lost about school right now (doing a bit of everything right now)…will eventually finish school to get a PhD in psychology (have the bachelor already). hoping to have re-careered in the golf industry by 2012 with an eye towards ownership in a small operation (TBD). I intend to be semi-retired by 45 (2 years) while owning a small business and taking the winters off. We will be mortgage free in 2 years or less. Will be building a home in NS in 4 years and plans to live “off the grid”. No need for great wealth, just enough to pay for bills and take a modest trip once per year. That being said, still have lots of work to do to put this plan into action but we are heading in the right direction. We have about $400K in savings/investments and significant inheritance $ sometime down the road. This book may just provide the added insight that we are looking for! Retire at 47 with full pension and hope to have much more income to add to the travel fund etc. Would need to have the house paid off as well! 34 yrs old with net worth about 460k. Our debt consist of a huge mortgage from purchasing our first and current house at the all time high in 2008. We are however on track to pay it off by the end of 2014 (if we do not have another baby). Looking to retire at around 55 with roughly $3MM net worth. I will find out more in 10 years on whether we will require more due to inflation, etc. The most interesting thing I want to share with people in their 20’s is that my wife and mine combined net worth did not increase significantly until we got married. I wasn’t really efficient with saving money in my 20’s. 33, single. 115K in RRSP, 33K in defined contribution pension plan, 17K in TFSA, 25K in cash. My home is worth somewhere between 460-500K and I owe 340K on the mortgage. I just started a new business and hope to retire at 45. 36 now, I’d like to “semi-retire” early – by 50, then work part-time in various businesses off-and-on until 75 (or sooner, as required). I’m 29 and plan to retire from a Company at 40 max. I would like to have something setup by that time where I can work a few hours a week when I choose and play sports the rest of the day and spend time with my kid(s). I would need about 1M stored away with my wife getting a gov pension. Under 35 with my home almost paid for. Hope to max out TFSA this year. Networth is approx 150k. goal is 1 million without defined benefits. Almost 42. Would like to retire at 58 when youngest son turns 18.Would like something around $2 million net assets. Currently around $400,000 so is doable. Would like to retire by 50….45 would be better! Rounding off 25. Finished school a year and a half ago. 7k in visa debt and 23k in student loan debt. Currently trying to pay down the visa debt as fast as possible while still putting $400/mo into TFSA & RRSP. Aiming to break even by the end of 2011. Trying to form up solid plans to retire between 50 and 55. My wife & I are 39 & 41 respectively. Around $950K NW ($550K house, no mortgage / $400K financial assets). No liabilities. I think (hope) 55 is the magic number, but it would be nice to get financial assets to $1.5M before committing to that plan! 37 – semi retired (doing a bit of consulting) – own several cash flow positive rental properties. The key to getting out of the rat race early is tax efficiency (RRSP, TFSA, Buiness income and write offs). I’ve followed Tim’s blog for about a year now and would love to win the book. I’m a youngin at 23, and I hope to be working part time at 45 and completely out of the rat race by 55. I value my free time more than luxury goods! Looking to retire at 53 (Magic 80 Pension) with paid off mortgage and investment property. I put away rsps via mutual funds, tfsa for leisure. Hope to sell one of the houses and buy another to sell again before retiring is an added benefit. Retiring at 55 will give me more time to enjoy life Am heading towards 50 but that book will be a good piece of advice to my not so practical children. Just turned 32 yesterday!!! My wife is 33 and our daughter is 2. Wife’s income = $0 (currently going to school to enhance her skill sets). Current asset = $300K, nothing in RRSP/TFSA. Age 52, a bit over 500k, no debt or mortgage, retire 75. Almost 50, spouse 55. 4 children all approaching university but fully funded RESP. Mortgage free on primary and recreational residence with RRSP and TFSA maxed. Just working for the kids and grandkids now and feel like I may wrap it up any day now but probably will hang in for a couple more years before transitioning to something a bit less stressful – teaching. May decide to carry that on for years because it is very rewarding and will keep the mind moving. Planning lots of travel and overseas teaching before settling down. 40, net worth approx $1.1M, no mortgage. 3 kids in elementary school. Would like freedom 55 and net worth of $2.5M, but it might be hard to walk away from well paying job at that age. Good at paying off debt, but need ideas for investing. 36 yrs old, wife 35 yrs old, net worth: $435K, mortgage: $442K, 2 kids, realistic goal for retirement: 65 yrs; optimistic goal: 50 yrs, hoping to have around a nest egg of $3-4 mil by the time we retire ($1.5 to 2 mil each). Also have an ambitious goal of owning 1 investment property every 5-7 years, so by the time we retire we will have around 3-5 properties that we can then sell in every 5-7 years after retirement to compensate for any investment/nest-egg losses or unexpected expenditures after retirement. @MDJ: I follow you already on twitter as bhattu1974. Under 35. Begin to take control of my financial destiny, and be mortgage free by 45. I want to retire early and enjoying going around the world. Currently 42…shooting for semi-retirement by 45…full retirement by 50 with 1.7M in investments and zero debt. Age 38. Assets $850K+. $400K nest egg. No debt…own a home and vacation residence. Plan to retire at 48. Kids fully funded with RESP’s. Am a supersaver with over 50% of income going to savings. 37, run my blog (My Own Advisor), work and want to live a full, vibrant and healthy life. I haven’t really determined my retirement age, but 55 sounds perfect. My goal by 50 is to have a paid off home and no debt. Currently working towards building a diverse and robust dividend-stock portfolio, a TFSA portfolio, and a RRSP portfolio made up of ~80% indexed products. Finally, congrats to Tim. A great achievement and an inspiration! Keep up the good work yourself MDJ! Hope to learn a few things from Tim’s book ! 32, married, with 2 kids under 6, plan to retire at 55-60 with 800K in investments/savings and no debt/mortgage. Defined Pension Plan will kick in at 57. Currently working hard at paying off our mortgage and maxing out our RRSP and RDSP contributions. Have saved approx. 20K each for kids education so far. Reading everyone’s comments is inspiring me to save even more! Too late for 45, but I read these columns with interest nevertheless. Currently going the TFSA route, with some slim RRSP savings and no mortgage or debt. 46, net worth 1M. Don’t know when I’ll retire. Would need 2-3 M to retire with current lifestyle. I actually really like my job! Retired (or have the option to retire, as I love my job currently) at age 50. I have no debt now other than a mortgage I want to be done with by age 45. For retirement, a combination of rental properties, a dividend-stock portfolio, TFSA and RRSP, combined with simple living. I fully intend to continue helping people get control of their personal finance and achieve financial peace, as I do now part-time. I doubt there will be any lack of people in need of such help twenty years from now (unfortunately). age 42, 1.5million net worth. Will retire at 55 b/c I want my pension and medical/dental benefits. max out on TFSA. No room for RRSP b./c it went to the pension plan. Just hope I live long enough to enjoy it. People are dying off all around me. Age 45,retired ,”freedom 42!”.My hubby still works,47,but only 6 months of the year.NO mortgage,paid a couple of years ago.We paid $120,000 off as quick as humanly possible:6 yrs.Maxed out rrsp cont.Lived below our means.Just got back from down south.Been spending winter there last few years,4 months.One teenager.Mixed bag of investments.Self taught in stock market.Avid reader.Husband makes less than $100,000.Not what you make…it’s what you SPEND.AS our friends say…we are living the dream. 39, married with 2 elementary school kids. $1.6M portfolio plus a principal residence worth $500K. We have been debt free for 8 years. Would like to retire in 4 years at age 43 with $2.5M portfolio. Portfolio has a yield of about 2.5%, want to bump that up to around 3.5%. Age 35, Family of 4 (me,wife, 2 children aged 8 and 10). I work full time, wife is part time. Planning for early retirement. Exact age not yet set, but at latest 55, with the options open for earlier. 50 sounds good. Living frugal, keep expenses low, and continue with steady debt repayment. We work/live/play all in the same town to keep transportation to a minimum. Spend less than you make… <50% ! 31, both my wife and I have pensions which kick in at 55, but neither of us plan on working that long. knowledge is power, read and learn with every opportunity, learn what others have done and found to work. many millionaires live well below their means, its not always what you make but what you dont spend – live simply, small house but its enough, live a little further away from a major employer, bit more of a commute but housing prices are less than half. Entrepreneur on the side, take advantage of all available tax deductions and options available, part of what you dont spend is only giving the gov’t what you really need to. Opted to focus on TFSAs instead of RRSPs for now as income after retirement will likely be higher and taxed heavier. One thing I find incredibly absurd is how vast swaths of (educated!) people enter the work force with the dream of leaving it as soon as possible. Bizarre. Perhaps before that people need to ask, “Why Do You Want to Work?”. If the answer is “just for the money so you can retire as fast as possible”, then simply choose the career/job that doles out the greatest amount of money. Anything else is the wrong choice. If you are working just for the money, it doesn’t matter what you do, right? Instead of struggling to fight your way out of a position in which you don’t want to be, in hopes of entering incredibly rare air space (millionairedom), why not start off doing something you truly want and work as hard at that as you do at escape? That plan would involve far greater, prolonged, and diverse wealth to all.